Celebrating the life of Joe Scranton, Jr.
Obituary for Joe Scranton, Jr.
Joe Scranton, Jr. was born on August 22, 1926 in Sealy, Texas. He was the first-born son of Joe Sr. and Eleanor (Brown) Scranton. He grew up in the Sealy neighborhood. Joe attended Austin County Colored School in Sealy, Texas. Joe was a devoted, loving father, husband, grandfather and great grandfather. Family, friends and neighbors knew him as a hard worker and giving soul. He embodied the definition of a good man, a man of God. He was a wonderful husband and father who loved and took pride in caring for his family, home and his neighborhood. On January 14, 1942, Joe enlisted and served four years in the United States Army where he served in New Guinea, Northern Solomons and the South Philippines Islands. He received the American Theater Campaign Medal, Asiatic-Pacific Campaign Medal with 3 Bronze Stars, Good Conduct Medal and the World II Victory Medal. Joe married the love of his life Norris Mae Anderson on July 20, 1947 in Sealy, Texas. To their loving union three children were added: Larry Wayne, Gerald (deceased) and Octavia. Joe was baptized into Christ on February 3, 1963 at Anderson St. Church Of Christ. He continued his faithfulness to the work of the Church in a leadership capacity. He had a great love for benevolence and was highly respected for his commitment, selfless spirit and love of God. Joe spearheaded Gospel meetings, training platforms for young ministers, setting up benevolence work as well as the maintenance and care of the Church. Not only did Joe serve the Lords Church but he also served the community by his outstanding service as Councilman for the City of Sealy. The honorable Joe Scranton served on the City Council for 31 years, from 1975 to 2006 and 23 of those years he served as Mayor Pro-Tem. In 1999, the Wal-Mart Foundation selected him as a recipient of the Home Town Leadership Award. He received letters of congratulations from Governor George W. Bush, Congressman Ron Paul, Texas House of Representative, Charles B. Jones, United States Senator Kay Bailey Hutchinson and United State Senator Phil Gramm. Joe implemented programs that would better the East side and the whole town. He along with his fellow council members authorized the administration to apply for grants to repair and enlarge water mains, resulting in Sealy being awarded a grant. He voted to construct a new water plant, saw to an expanded sewer plant being built and virtually every city street was improved. Joe backed the project of a 27-acre City Park and assisted in securing more police protection through hiring grants. Because of his position in the East Side Civic Association, Sealy citizens from all walks of life could work and play together in harmony. In the spring of 2002, in recognition of his leadership and commitment to the citizens of Sealy, the City Council dedicated the Joe Scranton Jr. Park in his honor. Joe also worked tirelessly on the appraisal District board. 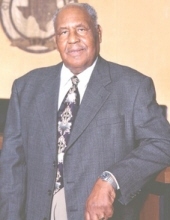 He served the board from 1997 through 2011. Joe was also a Railroad man. He worked as Supervisor for the Santa Fe Railroad with 30 years of service. While working there, Joe served as Secretary-Treasurer of his lodge from 1979 to 1999. In recognition of this service the brotherhood presented him with a service pin and lifetime membership. Joe departed this life on April 27, 2018. He is preceded in death by his wife: Norris Mae Anderson Scranton; his parents: Joe Scranton Sr. and Eleanor Brown Scranton; his son: Gerald Scranton; his brothers: Otis Scranton Sr; Harold W. Scranton; O. D. Scranton; his sisters: Gauvena Jackson; Dorothy Wilson; Angerline Hart; Josie Daniels; and his grandson Lauren Wendell Scranton. He leaves to cherish his memory his son: Larry Wayne Scranton (Judith), of Katy, TX. ; his daughter: Octavia Cooper (Cecil), of Katy, TX. ; his sisters: Ester Wyshaw, San Antonio, TX. ; Clarena Rome, San Antonio, TX. ; and Eleanor Owens, San Antonio, TX. He also leaves behind 8 grandchildren, 5 great grandchildren, 1 great-great grandchild and a host of nieces, nephews, relatives and friends. To send flowers or a remembrance gift to the family of Joe Scranton, Jr., please visit our Tribute Store. "Email Address" would like to share the life celebration of Joe Scranton, Jr.. Click on the "link" to go to share a favorite memory or leave a condolence message for the family.